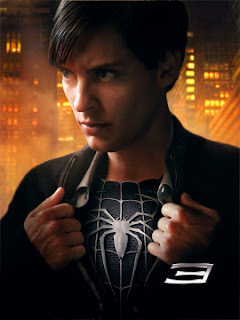 Yesterday night I went to see Spiderman 3 in a sold out theater. I have to admit it was a great movie. I'm not going to write a review or anything, but I did want to mention one of th funniest parts of the movie (don't worry I won't give away anything about the plot. Spiderman, really Peter Parker, went EMO! No joke, look at the picture. It was awesome. When the symbiote costume was on, but he was not acting as Spiderman, it was definitely the best part of the movie. It was not what I expected but definitely put a modern twist on the Spiderman series that was just perfect. There is also a dance number in the movie that was just perfect for the situation. It wasn't really very loyal to the Spiderman I remember, but since Toby is Spiderman, it worked out better then one would expect. At first, it seemed really strange that they would put three villains (Green Goblin in the form of Harry, Venom, and Sandman) all in one movie, but they really pulled it off. The special effects were really amazing, there were times that they seemed to be a bit on the video game said, but that did not detract from the movie. The only really sad part is that Pirates of the Caribbean: At World's End will more than likely beat Spiderman 3 out for the Oscar for best special effects from what I have seen so far. The ending of the movie actually surprised me. You have to accept that in super hero movies that large crowds of innocent people will just be standing around in harms way, but the final battle was really intense and the effects really shined. Also, the final twist at the end of the movie really brings it to a level way above the first two movies. It is hard to believe that the move Spiderman movie's they make, they better they get. I can't talk about a Marvel movie without mentioning Stan Lee's cameo appearance. This was by far his best ever. I'm not going to post what he said, but basically he exchanges some very motivational lines with Peter Parker. It is definitely one for the movie and comic book history books. I loved the 3rd Spiderman movie as well. You made some interesting obvervations.